There is no items in cart. Please customize your quantity and features below. Don’t forget to check that offset printing is selected if your design requires any coloured or black ink on paper stocks. Ordering for 10+ Names ? 1. Select the card quantity and print features. In order to get correct pricing, please make sure you have selected all the features you wish to apply on the card. 2. If you are unsure about the features, please click on the "?" icon and it will bring you to the information page for that feature. 3. 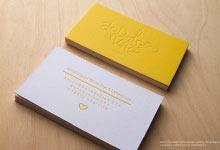 Make sure you read the card stock information and turnaround time. 4. You will be asked to upload your print file. Make sure you have setup the file in vector format according to our example. 5. Once the payment has completed, our designer will prepare a finalized print proof and send you a copy by email. 6. After you have approved the proof, we will start the production and will then provide you with a tracking number when it’s ready for shipping. 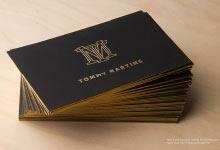 Our black metal cards are an exquisite addition to any business. Crafted from 0.5mm black anodized stainless steel these cards are as powerful as a solid hand shake. The base price of these cards includes non-bleed etching, as well as custom die cut and cut through with in our standard business card size of 3.5”x2”. Laser engraving can be used on these cards to create a metallic appearance to a design and spot colour can be used to add solid colours to accentuate your company’s branding. Variable data is also an option for clients looking to create membership cards or cards with unique codes. *Turn around time varies based on job complexity and size. Please feel free to contact us with any questions you may have. If you need more than +10 sets of cards or need special custom printing, please visit Custom Quotation page and get a free quotation. At RockDesign, we take our customer's core business values and express them in a creative and visual manner. Our knowledgeable designers are trained specifically for our printing processes. They bring this perspective to produce high end designs that will yield optimal final results.